Firematic Officers 2009: Fire Chief Gregory J. 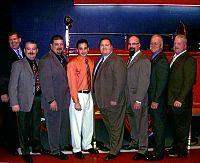 Butcher; Deputy Chief Kevin M. Koch; 1st Assistant Chief Matthew Osinski; 2nd Assistant Chief Christopher Soluri; Captains Edward Krecisz and Mark Sadkowski; EMS Captain Robert Cleveland, EMS Captain Bob Cleveland and Jeremy Pullano; Day Captain Paul D. Gorman; Fire Police Captain Donald Portik; and Training Officer Captain John Wenner. Administrative Officers 2009: President Mike Braun, Vice President Jeremy Pullano, Secretary Adrian Pilliod, Treasurer Tammy Jo Gorman, Sgt.-at-Arms Dave Khreis, Financial Secretary Anthony Mastantuono, Line Secretary David W. Cole. Island Fire Chief Greg Butcher reports that at 6:24 p.m. Tuesday, January 5, 2009 Rescue Personnel responded to a two-car collision at 2695 Grand Island Blvd., just east of Bedell Road. Both vehicles were reportedly southbound when one of the drivers lost control due to slippery road conditions and was "T-boned" in the process. GIFC Paramedics initiated ALS treatment upon Stephanie Ali, 22, of Grand Island and her five-month-old daughter, both of whom sustained serious traumatic injuries. These effoerts continued during transport to Kenmore Mercy Hospital. The driver of the other vehicle which was towing a trailer with snowmobiles, Michael Szmanski, 43, of Niagara Falls and his passenger, Mark Szmanski, 17, claimed no injuries and declined treatment. GIFC units remained on scene until 10:25 p.m. to assist Erie County Sheriff's Dept. AIV officers during their ongoing investigation. Grand Island Fire Chief Greg Butcher reports that on Wednesday, December 16th, it was discovered that unknown persons stole a portable generator from the GIFC radio transmission site. This generator was set up to provide backup in the event of a power outage so that there would be no interruption in dispatching of Fire and EMS emergencies. Chief Butcher stressed, the thievery of this critical piece of equipment has now forced the GIFC to implement a special contingency plan, pending replacement efforts, so that community protection is not compromised. Assistant Chief Chris Soluri identified the stolen item as a 700 watt Briggs and Stratton (propane) generator, tan in color, model #CHGEN 7000, serial #1010562448. He noted that the purchase and installation of this item amounted to $6,200. Although exact replacement costs have yet to be determined, funds will have to be diverted from other important budgetary needs. This additional burden will not only be borne by the GIFC but ultimately by Grand Island residents. Anyone who has information regarding this criminal act is urged to contact the Erie County Sheriffs Dept. at telephone # 667-5200. The Sheriffs Dept. is currently investigating this serious matter. Grand Island firefighters responded at 1:41 a.m. Wednesday, November 25 to a mutual aid call for assistance from the City of Tonawanda Fire Dept., which was conducting a major firefighting operation on Wales Street. Grand Island Fire Chief Greg Butcher, Engine #3, and an EMS crew were placed on standby at City Fire Headquarters, 44 William Street, until 7:01 a.m. when relieved of duty. During that time, GIFC personnel responded to two medical emergencies involving a 70-year-old resident requiring assistance, and another situation where no services were rendered. Chief Butcher stressed that this sharing of resources is an integral part of the entire fire service which assures that necessary equipment and manpower is always available so that every Fire Dept. can fulfill its community protection responsibilities without shortchanging its citizens in any way. 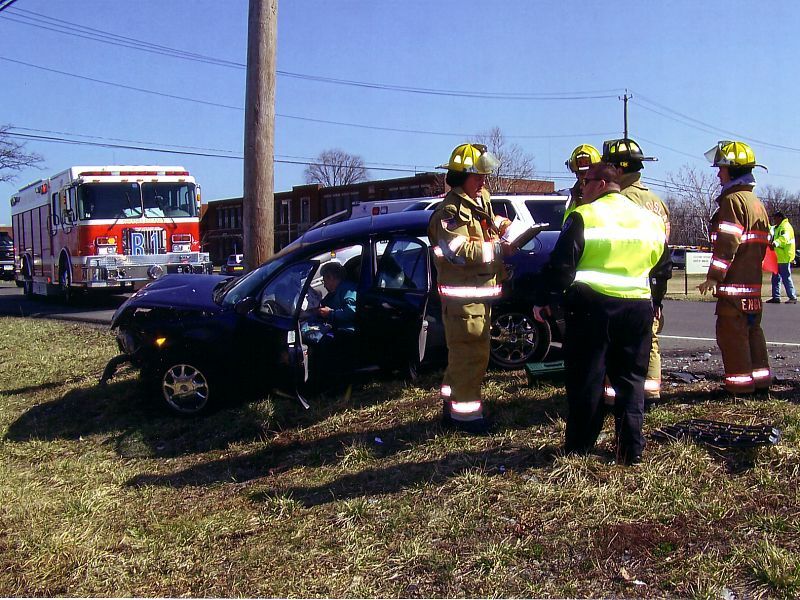 Firefighters used 'Jaws of Life' extrication equipment to free trapped victim. 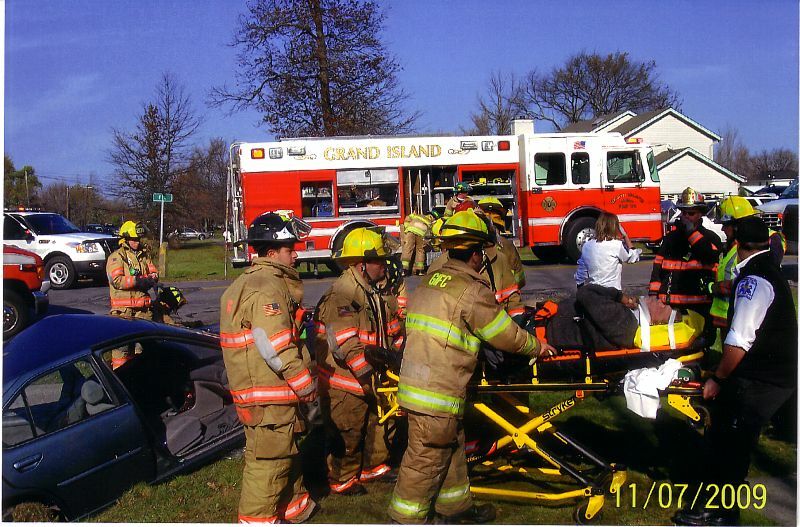 Grand Island Fire Company rescue personnel responded at 12:43 p.m. Saturday, November 7, 2009 to a two-car collision at the intersection of Fix and Baseline roads. Deputy Chief Kevin Koch directed extrication operations to free Francis Salvamoser, 72, of Kenmore, NY from his vehicle, which was slammed into a concrete culvert and into a deep ditch by the force of impact. Salvamoser was treated at the scene for traumatic bodily injuries and transported to ECMC by Mercy Flight for additional medical follow-up. 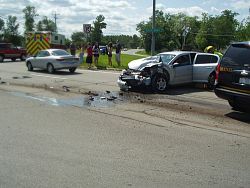 Occupants of the other vehicle, Nancy and Ronald Kawecki of Grand island, claimed no injuries and refused treatment. Fire Chief Greg Butcher reported all GIFC units in service at 1:16 p.m. Approximately 3000 school students and Open House visitors received fire safety tips, hazard recognition, "hands on" firefighting experience, a 'crash course' in dispatch and emergency operations, equipment demos and displays, etc. during the past week, according to GIFC Chief Greg Butcher. Fire Prevention Program Coordinator Chris Soluri arranged an impressive flag raising ceremony by a Sheridan Park VFD Ladder Truck and GIFC's Crimson LT #6. In addition, visitors were treated to a 'Jaws of Life' auto exercise with simulated victim rescue, as well as a 'live' vehicle fire demo. Other popular activities included hose practice for kids and unique demo/displays by the New York State Police Mobil Response Team, NYS Park Police, U. S. Customs and Border Patrol (helicopter), Erie County Sheriff's Dept. Special Services Unit, E. C. Emergency Services, U. S. Coast Guard, CERT Team, E. C. Senior Services, City of Tonawanda FD, Getzville VFD, Wendelville VFD, Grand Island PD, and a Pizza Hut Safety Team for trick & treaters. Program Coordinator Soluri noted that kids were quick to participate in the highly prized 'Ride to School In A Fire Truck' raffle for elementary school students - winners and ride schedule to be announced. Wendy's Restaurant also provided French fry food vouchers for those who completed their Fire Safety checklists, and the Hobby Shop donated a gift certificate which was included in the model fire truck drawing. Another program highlight was the presentation of a $5000 check from NYS Assemblyman Sam Hoyt to the GIFC for purchase of firefighter safety equipment. 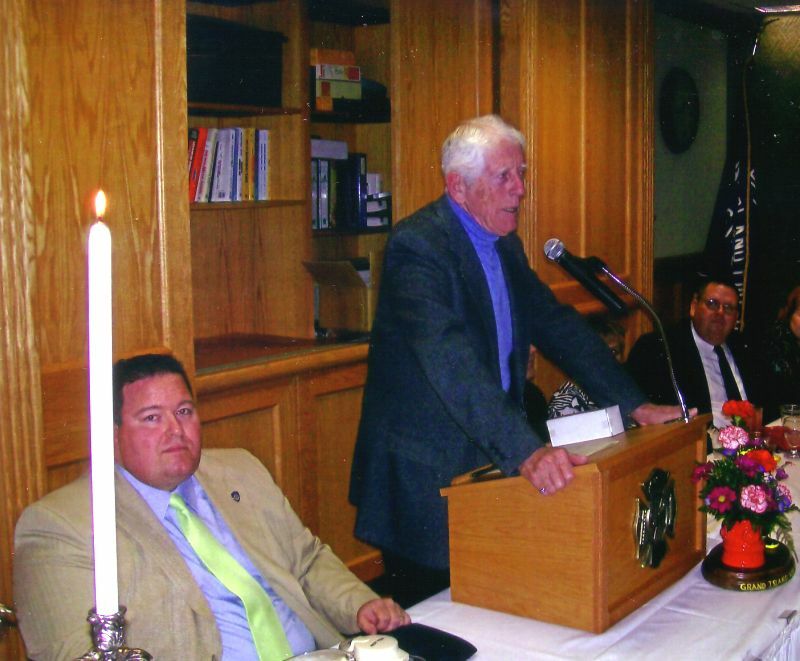 In addition, Medical Director Edward "Ted" Rayhill received a special 2009 Fire Prevention commendation as the "Founding Father" of the GIFC Paramedic Program, which came into being on October 6, 1979. A hearty thank you to the GIFC Ladies Auxiliary who provided Open House food, and the many other 'Volunteers' who made this year's program such a tremendous success. Grand Island Fire Chief Butcher is proud to report that GIFC Medical Director Edward "Ted" Rayhill, MD, will receive a special commendation for his exceptional, individual achievements. This award presentation will take place during the upcoming Fire Prevention Open House at Fire Headquarters between 5 p.m. and 8 p.m. on Friday, October 9. Rayhill is being recognized as the "Founding Father" of the GIFC Paramedic Program, which came into being on October 6, 1979. In addition, it was noted that his lifetime of support and guidance as a GIFC Medical Director, has served as an inspiration to all dedicated EMS practitioners. Congratulations to "Ted" for his outstanding community service accomplishments which represent the true spirit of fire prevention and safety at its very best. Fire Chief Greg Butcher reminds all Islanders that 'Sparky' the fire dog and 'Pluggie' the fire hydrant are anxiously waiting to greet visitors at the October 9th Fire Prevention Open House at GIFC headquarters, 2275 Baseline Road. Fire Prevention Program Coordinator Chris Soluri states that many agencies will contribute to the firefighting and lifesaving equipment that will be on display from 5 p.m. to 8 p.m. that special date. 'Live' fire demos, "Jaws of Life" vehicle extrication, hose practice for kids, etc. will add to the thrilling atmosphere of simulated emergencies, he noted. Firefighter education/safety teams will also visit elementary schools from October 5th through October 9th to give students a 'birds eye' view of emergency situations, and how to recognize and handle them. The ever popular 'Ride to School in a Fire Truck' drawing will again be held, with six winners chosen from each of the following schools: St. Stephen, Huth Road, Kaegebein and Sidway. The GIFC Ladies Auxiliary will also conduct their hot dog/hamburger cookout for all those who bring a healthy appetite with them. Don't forget to set aside some quality time on Friday, October 9th to meet your Grand Island firefighter/medics and their many friends. Engine #5 and Ladder Truck #6, operated by Firefighters Dale Mock and Steve Morgan respectively, team up to give St. Stephen kids a much appreciaated "shower." Summer camp kids at St. Stephen's School, on Thursday, August 20, enjoyed an especially "cool" visit from Grand Island Fire Company Engine #5 and Ladder Truck #6, according to Capt. Don Portik. 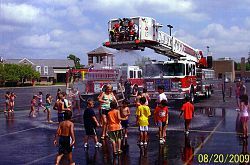 Approximately sixty youngsters beat the heat and humidity by cooling off under a huge shower of water provided by LT #6. While having some summer fun, they also learned something about high volumn nozzles and how a water relay from one truck to another works. Summer Camp Director Lynn Ortiz thanked firefighters for spending some quality time with her kids who were thrilled with this opportunity to wind down the summer with the GIFC. Fire Chief Greg Butcher takes great pride in the Grand Island Fire Company EMS program and reports that fifty-four of its 'team' members were recently honored at a special EMS "Appreciation" event, held at fire headquarters on Friday, August 28. EMS Captain Bob Cleveland points out that a professional group of Medical Directors (physicians), NYS EMS instructors, paramedics, Critical Care personnel, EMTs, and CFRs were recognized for their lifetime contributions to the Grand Island community. Bob also noted that another milestone will be reached in October 2009. It was thirty years ago on October 6, 1979 when Dr. "Ted" Rayhill, Lance Kohn, and other GIFC officers won a prolonged battle to establish a Paramedic program for Grand Island. A heartfelt thanks to these dedicated volunteers, who make Grand Island a safer place to live. 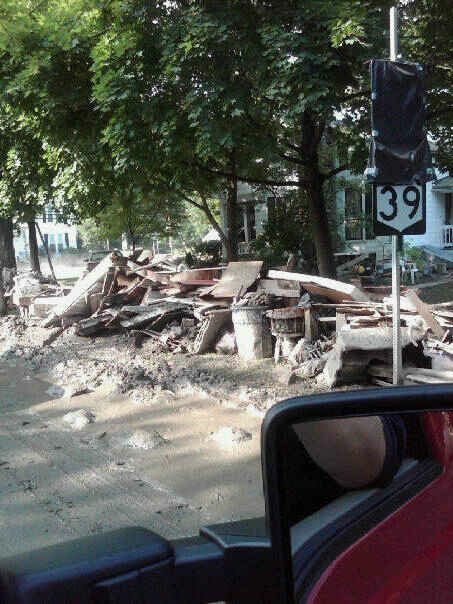 A group of Grand Island Fire Company firefighters spent a day in Gowanda assisting with the damage caused by the August 9-10 flooding. The GIFC was activated as part of the New York State's mutual aid agreement through the county fire coordinator. "On the day we were there 12 other local companies were there to assist as well," Fire Chief Greg Butcher said. 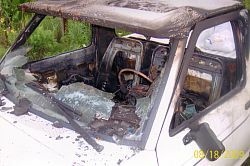 Interior view of extensively damaged Ford Ranger. Grand Island Firefighters responded at 12:15 a.m. Monday, August 17 to a report of a "working car fire" in the parking lot of the Country Glen Apartments at 2155 Bedell Road. When Engine #3 and fire suppression crews arrived on location, heavy smoke and flames were venting from a parked 1994 Ford Ranger, according to the GIFC Capt. Mark Sadkowski. Although the fire was extinguished within 10 minutes, damage was estimated at $2000 with the vehicle considered a total loss. The origin appeared to be in the interior passenger area but the exact cause remains undetermined. All GIFC units returned in service at 1:11 a.m. according to Capt. Sadkowski. Grand Island Fire Company rescue personnel, at 7 a.m. Monday, August 10, 2009, initiated search procedures in the Niagara River between the Holiday Inn and South Grand Island Bridge where a passing motorist reportedly observed someone jump into the water from a high span. GIFC Assistant Chief Chris Soluri confirmed that the City of Tonawanda Police Dept., U. S. Coast Guard, and Border Patrol joined in the prolonged search operations which lasted slightly over two hours. Contingents from the NYSP and ECSD were also on location. Nevertheless, combined efforts, which included a Border Patrol helicopter, failed to turn up any sign of any victim. All units, except for the U.S.C.G., returned in service at 9:04 a.m. according to Chief Soluri. Will this fatal MVA lead to future litigation involving GIFC firefighter/medics? Grand Island Fire Chief Greg Butcher points out that the recent Fire Expo 2009 convention held in Baltimore, MD during July was a valuable learning experience for many, as well as an opportunity for others to contribute by "sharing." Two members of the GIFC should be recognized for their individual contributions relating to leadership training, safe operation of fire apparatus, and EMS/ALS expertise, he noted. On July 22, Board member Mike Dallessandro spearheaded an all day program, "Leading the Volunteers," which highlighted professional conduct, behavior, and leadership for volunteers, who comprise 72% of the entire U. S. fire service. In addition, on July 23, Mike expressed his concern over the pressing need to improve firefighter safety by presenting a special class, "Creating a Fire Apparatus Driver SOP." It must be noted that an NFPA report for 2008 indicates that there were 103 line of duty deaths nationwide, with 39 occurring while firefighters were responding or returning from emergency incidents. Accordingly, Mike is convinced that his message "drive safe, drive smart" will contribute to the adoption of more enlightened driving practices so that the goal - everyone returns home without unnecessary injury or death, becomes more of a reality. Meanwhile, Board member Steve Stouter contributed his 19 years of GIFC Paramedic experience by participating in an EMS 'mock trial' which revolved around a legal claim of gross negligence. Steve had to defend treatment given to a stroke patient who refused hospitalization. Reporter Susan Nicol Kyle of the EMS Responder News, who covered the exercise, noted that Stouter maintained his composure under intensive questioning about procedures taken, despite an incomplete patient information report. Lawrence T. Bennett, Deputy Director of Fire Science at the University of Cincinnati, reminded class participants that, as a matter of proof, if something is not documented, it did not happen. Stouter concluded that such trials are "great teaching tools" for practicing medics. He added that its a lot tougher having to answer questions in court several years after the fact, than it is to provide ALS treatment initially, but that all EMS personnel should be prepared for such an eventuality. Thanks to such expert training programs, which include GIFC volunteers, the entire fire service has learned some valuable on the job lessons. Grand Island rescue personnel responded shortly after 3 p.m. Wednesday, August 5 to a two-car MVA at the intersection of Love Road and Beaver Island Parkway. Fire Chief Greg Butcher confirmed that Robbie Bukowski, 32, of West Seneca, NY had to be extricated from his vehicle, following a rear end collision. He was treated by GIFC medics for non life threatening injuries, stabilized, and transported to Erie County Medical Center for follow-up medical attention. A two-year-old child (passenger) was restrained in a car seat, evaluated, and transported to Women and Children's Hospital of Buffalo as a precautionary measure. 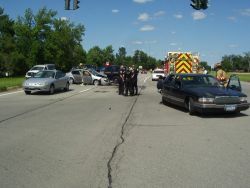 The second driver, Marilyn Gratto, 73, of Grand Island, denied injuries and declined hospitalization. Chief Butcher stated that all GIFC units returned in service at 3:47 p.m. at which time normal traffic was restored at that location. Grand Island firefighters responded at 1:40 p.m. Tuesday, July 28 to a reported structure fire at the Wallace Drive residence of Peter Pitts, who was not at home at the time. An alert neighbor called 911 for emergency GIFC assistance. When GIFC Engines #2 and #3 and firefighting crews arrived on location within two minutes, it was discovered that the primary electrical service line had shorted out against metal siding and started a fire on an outside wall, according to Chief Greg Butcher. National Grid was called to the scene to cut incoming power and the fire was extinguished with no extension to the interior. Chief Butcher confirmed that damage to the building was limited to approximately $1500 and all GIFC units returned in service at 2:52 p.m. after ventilation of the home was completed. Grand Island Firefighters at 4:15 a.m. Wednesday, July 15, under the direction of Deputy Chief Kevin Koch, responded to a request for mutual aid assistance from Niagara County Fire Control. Several other volunteer fire companies were assisting Niagara Active Fire Co. in battling a huge blaze at Dave's Auto Recovery, 2998 Delaware Ave. in the Town of Niagara, involving over 100 scrapped autos, buses, and storage buildings. GIFC Engine #3 and a firefighting crew remained on standby at Niagara Active's fire hall on Lockport Road until relieved of duty at 8:50 a.m.
GIFC Chief Greg Butcher points out that local volunteer fire companies place heavy reliance upon mutual aid arrangements which assure that additional manpower and equipment is always available in the event of a major emergency, such as in this particular instance. Sharing of equipment is also an important money saver for some smaller departments that must operate on limited budgets and may not be able to afford a costly ladder truck or other specialized equipment. This "pooling of resources" provides extra assurance that no community is ever shortchanged when it comes to fire and EMS protection, he stressed. Grand Island Firefighters at 9:28 a.m. Monday, July 20 and under the direction of Chief Greg Butcher, responded to a request for mutual aid assistance from Tonawanda Fire Control. volunteer fire companies including Kenmore, Ellwood, Brighton, Sheridan Park, River Road, Kenilworth and the City of Tonawanda were battling an oil tank fire at 5335 River Road when GIFC FAST Team assistance was requested. Ellwood Chief Mike Iannello was OIC of this District 1 alarm which was initially caused when workmen using an acetlyn torch to dismantle an abandoned tank, accidentally ignited approximately 45,000 gallons of oil sludge at the bottom of the container. GIFC Chief Butcher assisted the Command Center with logistics and PR, while Deputy Chief Kevin Koch assisted with acquisition of additional foam supplies, and Assistant Chief Matt Osinski assisted with fire suppression operations. GIFC Engine #3 and Rescue #2 also remained on duty at the scene until released at 2:01 p.m.
Chief Butcher noted that this was the second time within six days that the GIFC was called upon to assist other local volunteer departments during a major emergency situation. Grand Island Firefighters responded shortly after 8 p.m Friday, July 3, 2009 to a report of a "leaking propane tank" at the Stanley Garrison home on Whitehaven Road. GIFC Capt. Pete Sukmanowski reported that the homeowner was able to move the propane cylinder outside of the residence prior to the arrival of firefighters, who were then able to isolate the hazard. Ventilation of the premises was then commenced to remove any excess gases, as well as "high" concentrations of CO (carbon monoxide) which were found in the basement. National Fuel representatives were also called to the scene to rule out any other dangerous sources and none was discovered. There were no injuries reported according to Capt. Sukmanowski and all GIFC units returned in service at 8:49 p.m.
Grand Island Fire Chief Greg Butcher reports that motor vehicle related incidents are again on the rise, with three occurring between June 24th and June 26th. This is a trend that repeats itself during heavy traffic patterns at this time of year, he noted. Shortly before 12 noon on Wednesday, June 24th, 87-year-old Gordon Williams of Grand Island, lost control of his vehicle, which careened off the roadway, through a tree and into a deep ditch on Staley Road near East River Road. His wife, 89-year-old Marcella, who was a passenger, was stabilized by GIFC medics and transported to Kenmore Mercy Hospital as a precautionary measure. Gordon claimed no injuries. At 11:50 a.m. on Thursday, June 25th, 42-year-old Stephanie Kennedy of River Oaks Dr. sustained a leg injury while backing her vehicle out of the garage. She declined hospitalization after an evaluation by GIFC personnel at the scene. Finally at 7:33 p.m. on Friday, June 26th, GIFC Rescue Personnel responded to a a report of a 2 1/2-year-old child "locked in a vehicle" at the Ode residence on Foxcroft Drive. Just prior to their arrival however, a AAA tow truck driver was able to open a car door to free the (accidentally) trapped youngster. She was then evaluated by GIFC medics who found no serious aftereffects. GIFC Assistant Chief Chris Soluri noted that although she didn't appear to be frightened, she was in awe of the firefighter/medics and their rescue truck that came to help her. 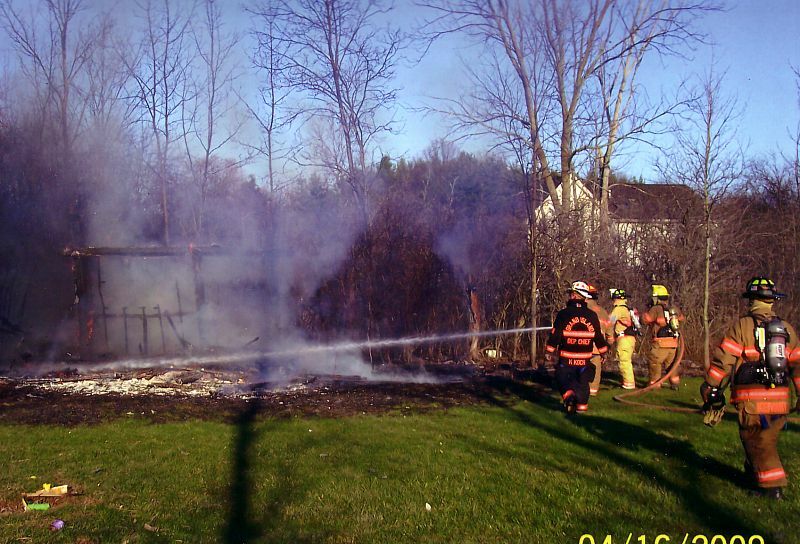 Grand Island firefighters responded at 8:32 a.m. Thursday, June 11 to a reported "shed fire" at the Schwegler Road residence of April Wright. GIFC Assistant Chief Matt Osinski confirmed that heavy smoke was pouring out of the backyard storage barn/shed when firefighting apparatus and manpower arrived on location three minutes after the alarm was sounded. 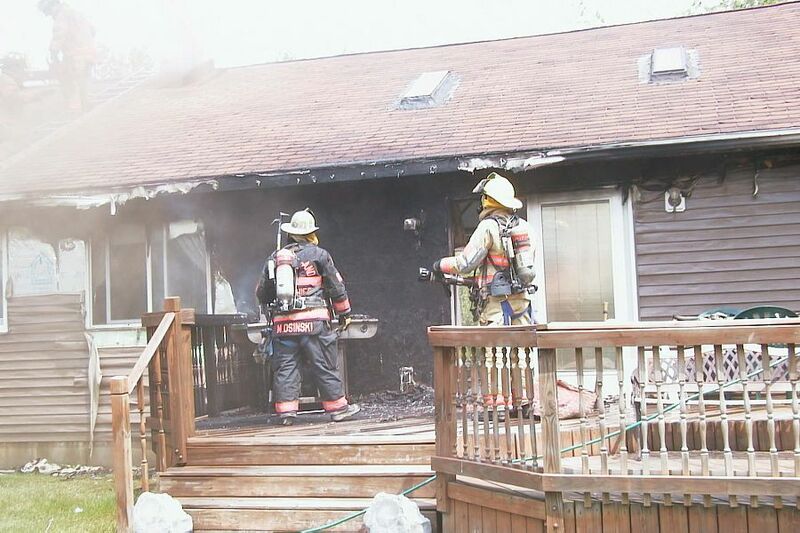 The blaze was extinguished within seven minutes and damage was estimated at $1999 to the structure and contents. GIFC Fire Investigator Chuck Berlinger determined that the cause of the fire was "improper use of an insecticide bomb" when the homeowner attempted to get rid of a rodent infestation. All GIFC units returned in service at 9:42 a.m. after overhaul was completed, according to Assist Chief Osinski. Grand Island Fire Company Marine Rescue Units were alerted shortly before 8 p.m. Sunday, June 7th to a report of three occupants of a boat who were stranded after running aground in the vicinity of the Tonawanda water intake across from the Holiday Inn. GIFC Assistant Chief Chris Soluri confirmed that a Niagara County Sheriff's Dept. vessel reached the area first but was unable to effect a rescue due to shallow water encountered. Because the craft in distress was also taking on water, the GIFC Marine Unit closest to the scene was called upon to pick up the boaters and transfer them to the NCSD boat. The three claimed no injuries. GIFC Marine units returned in service at 8:32 p.m. according to Assistant Chief Soluri. 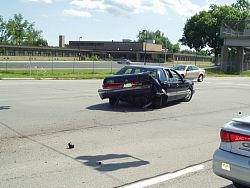 Grand Island Fire Company Rescue Personnel responded to a one-car MVA shortly after 2 p.m. Sunday, June 7 that occurred on the southbound I-190, just north of the Whitehaven Road interchange (MP 17.9). GIFC Assistant Chief Chris Soluri stated that Ronald Parker, 47, of Niagara Falls reportedly lost control of his vehicle which went off the shoulder, rolled over several times, and ended up on guardrails in the center median. He was ejected from his auto and was lying in the roadway when GIFC Firefighter/Medics arrived on location two minutes later. Meanwhile, rescue breathing had been initiated by a Buffalo Fire Dept. EMT who had stopped at the scene. Despite intensive ALS efforts by GIFC medics and a physician who had also stopped to render assistance, Parker did not survive his severe traumatic injuries. All GIFC units returned in service at 2:50 p.m. after the scene had been turned over to the New York State Police and normal traffic restore, according to Assistant Chief Soluri. 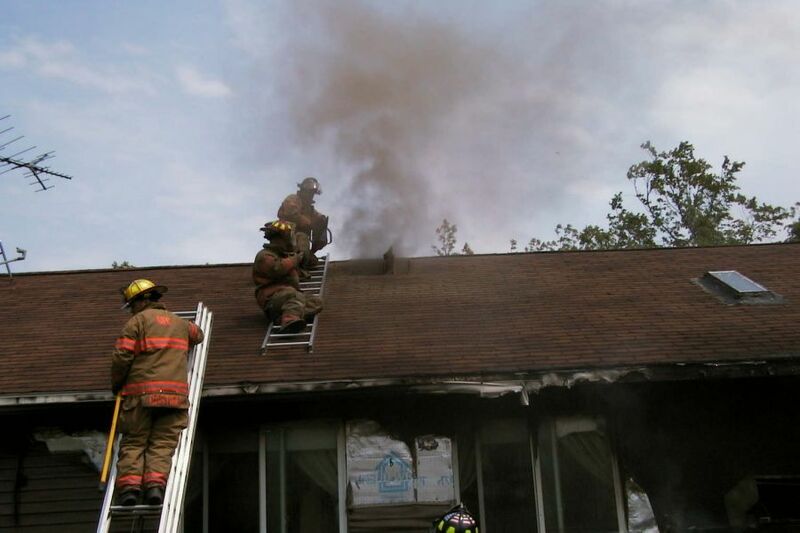 Grand Island Firefighters responded shortly after 2 p.m. Friday, May 22 to a reported "structure fire" at the Whitfield home on Baseline Road. GIFC Chief Greg Butcher confirmed that heavy smoke was venting from the roof at the rear of the building when Engines #2, #3, #5 and Ladder Truck #6 arrived on location three minutes after the alarm was received. Nevertheless, fire suppression crews under the direction of Deputy Chief Kevin Koch had the blaze under control three minutes later, which prevented extension into the lower living levels. GIFC Fire Investigator Chuck Berlinger indicated that a malfunctioning propane grill ignited vinyl siding above a rear deck area. The fire then traveled upward and broke through an overhang (soffit) at roof level where most of the burning was concentrated. Total damage, including that caused by smoke and water, was estimated at $65,000. Meanwhile, a Sheridan Park VFD FAST Team remained on mutual aid standby for the duration of the firefighting operation, as well as overhaul, etc. There were no injuries to occupants, who had safely exited the building, or firefighters. All GIFC and other participating units returned in service at 3:33 p.m. after traffic was restored on Baseline Road between Love and Staley roads, according to Chief Butcher. 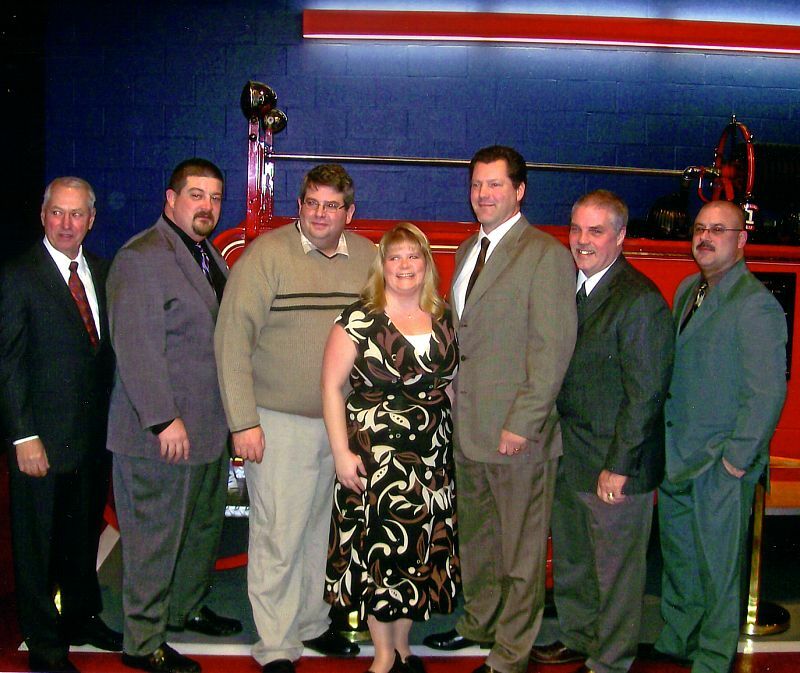 President Mike Braun welcomed firefighters, spouses, town officials, and special guests to share in the 71st anniversary celebration of the Grand Island Fire Company, which took place this past Saturday evening at Fire Headquarters. Fire Chief Greg Butcher noted that the establishment of a fledging Paramedics Program thirty years ago was one of the greatest GIFC achievements to date. This ground breaking treatment modality came into being because of the dogged persistence of Dr. Edward "Ted" Rayhill, who successfully overcame opposition from those in the health care system who insisted that it couldn't be done. As first GIFC Medical Director, he noted that "we started out with not much more than a stethoscope and blood pressure cuff." Since then, lifesaving accomplishments have been "phenomenal," and he heaped praise on those medics who have carried on since then. 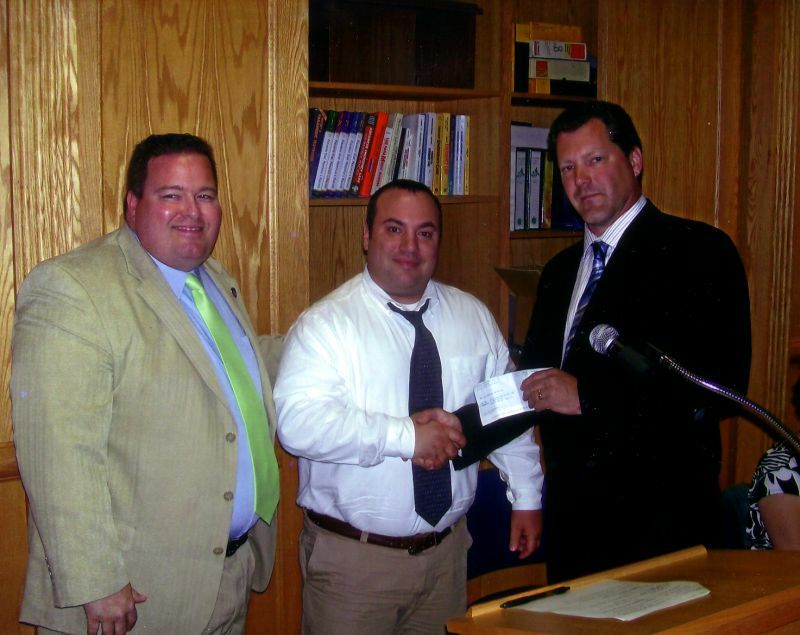 For the third year, the GIFC also received a $500.00 AHIC (Agency Hands In The Community) foundation grant from Phil Mastantuono of the Allstate Insurance Co. for "outstanding" community service work. Ladies Auxiliary President Arlene Soluri also recognized each and every firefighter for their daily sacrifices of time and effort over the past 71 years. Presentation of special 'years of service' awards reflected equivalent long term individual commitment to the ongoing success of the GIFC. Although no one received a 20-year life membership this year, eleven members exceeded that lofty goal. Most notable were Peter McMahon and Lee Becker who reached the 50-year mark. 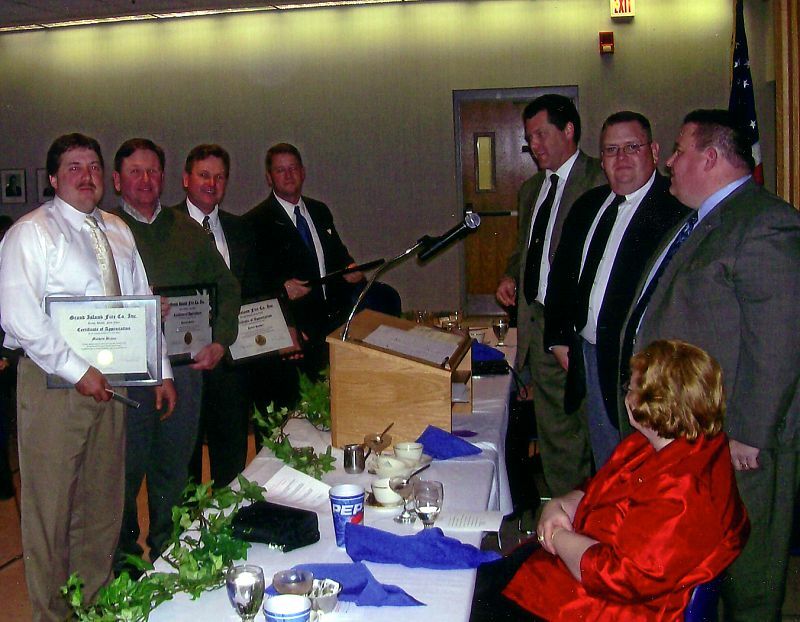 Consequently, they received additional recognition from FASNY, NS Dept. of State Bureau of Fire Prevention & Control, and NYS Assemblyman Sam Hoyt. Peter also received a commendation from the NYS Assoc. of Fire Chiefs. Past Chief Norm Mrkall was also recognized for his outstanding 55 years of service. GIFC Board Chairman Steve Stouter concluded the formal program with a huge thank you to all in attendance who directly or indirectly contributed to 71 years of community protection progress. Fire Chief Greg Butcher is pleased to announce that a 2009 FEMA grant awarded to the Grand Island Fire Company will result in substantial upgrades in EMS capabilities. He stressed that such funding is a crucial ingredient in the acquisition of specialized equipment which would not be possible under ordinary budgetary constraints. A $100,000 purchase of the latest twelve lead ZOLL cardiac monitors (five) and RAD 57 blood gas monitors (four) were recently made possible by this fire service support grant. EMS Capt. Bob Cleveland pointed out that this 'state of the art' technology brings the GIFC up to the highest national standard for pre hospital treatment of cardiac and stroke victims. As a result, post episode survivability has been greatly increased due to several factors, including ZOLL capnography which enables the user to immediately determine the overall effectiveness of treatment. Positive pressure rescue breathing techniques are also incorporated into ALS procedures which are being carefully implemented through training instruction by GIFC medical staff physicians Lee Ruotsi and Joe Takats. 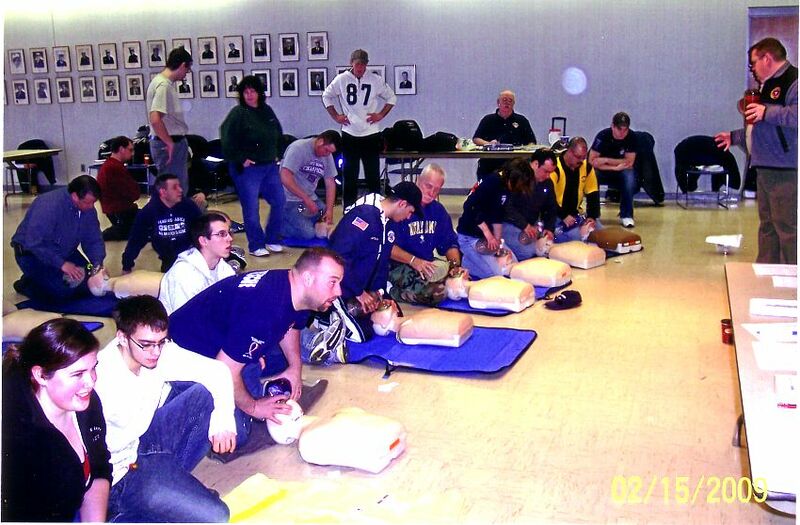 To date, fifty-eight GIFC EMS providers have become familiarized with this new ZOLL lifesaving equipment, and a new EMT class of over thirty students will take a final New York State certification exam on May 21, 2009. Grand Island firefighters responded at 6:22 p.m. Thursday, April 16 to a reported "barn fire" at the Falls Link residence of Mildred Dennis. GIFC Chief Greg Butcher confirmed that the 20' by 20' unattached storage shed/barn was "fully involved" when fire suppression equipment and manpower arrived on location. Attack crews led by Deputy Chief Kevin Koch had the fire out within twenty-one minutes, although the building was considered a total loss. Damage was estimated at $1000. Cause of the fire was attributed to a nearby bonfire which had not been properly extinguished and eventually ignited the tinder dry structure. A mutual aid contingent from the Sheridan Park VFD remained on standby duty at GIFC Headquarters during the entire firefighting operation. All participating units returned in service at 7:13 p.m. according to Chief Butcher. Grand Island Fire Company Rescue Personnel responded at shortly after 11 a.m. Tuesday, March 31 to a two-car collision at 2391 Baseline Road across from the U. S. Post Office. Fire Chief Greg Butcher reports that Ronald Rundberg, 76, of Buffalo, was treated at the scene by GIFC paramedics for upper body trauma, and transported to the Erie County Medical Center for additional medical attention. Islander residents Marcia Fritschi, 81, and Jason Fritschi, 21 were evaluated for non-life threatening injuries and transported to Kenmore Mercy Hospital as a precautionary measure. All GIFC units returned in service at 11:33 a.m. according to Chief Butcher. Fire Chief Greg Butcher reports that thirty-five Grand Island firefighters and ten others have elected to sacrifice their Sunday "R&R" from January 18th through May 2009 while they pursue EMT studies at Fire Headquarters, 2275 Baseline Road. Training Coordinator Lance Kohn noted that these dedicated individuals will develop skill levels that further enhance BLS and ALS capabilities of the GIFC. When certified by the NYS Health Dept. they will join a professional team of CFRs, EMTs and Paramedics that receive ongoing instruction by an in house staff of Medical Directors (physicians). Lead Instructor Dave Tolejko and EMS Capt. Bob Cleveland joined with Kohn in expressing gratitude and admiration for their students, who have placed such high value on their community protection responsibilities. "Good luck to these aspiring EMT caregivers who have chosen service to others as their ultimate reward." Grand Island firefighters at 2:18 p.m. Tuesday, February 10, 2009 responded to an alarm of fire at the Grand Island High School, 1100 Ransom Road. GIFC Assistant Chief Chris Soluri reported that approximately 200 students were evacuated from the building by school officials as smoke spread upward from an electrical fire originating in a basement "break room." A school custodian was able to extinguish the fire which was confined to the area of origin. Grand Island firefighters determined that there was no hazardous extension into the structure itself and then commenced a prolonged ventilation operation. Meanwhile, students were relocated to the school auditorium which was considered a safe zone. 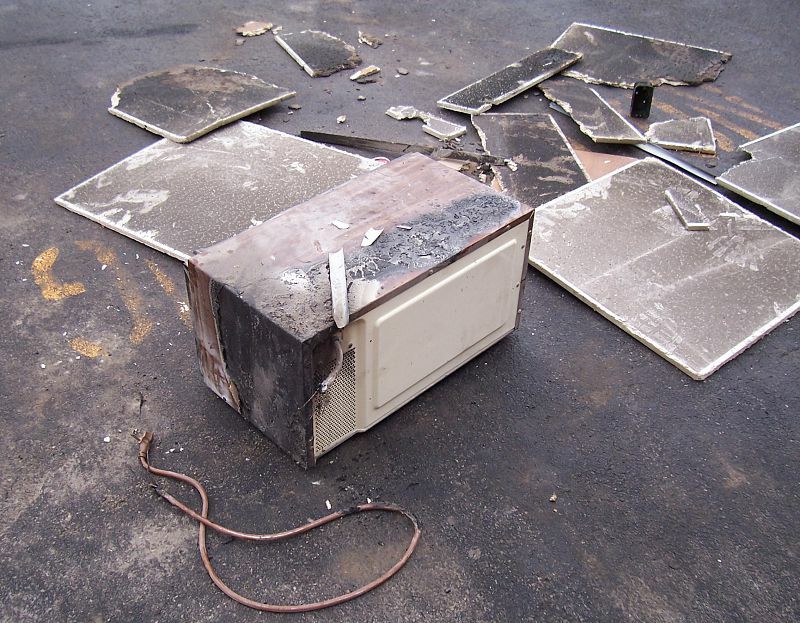 GIFC Fire Investigator Chuck Berlinger, assisted by the New York State Police, confirmed that a fluorescent light ballast had ignited and dropped burning embers onto a microwave and other materials which also caught fire. 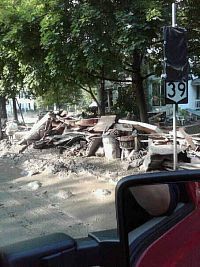 He praised quick action by custodian Chris Cevaer which limited total damage to an estimated $2000. School Superintendent Robert Christmann noted that the school is back on a normal schedule after extensive overnight cleanup and air quality testing Wednesday morning. All GIFC units returned in service at 4:15 p.m. Tuesday, according to Assistant Chief Soluri. Grand Island Fire Company Rescue Personnel responded at 10 p.m. Monday, February 2 to a one-car MVA at 2697 Baseline Road across from the Normandy Square apartment complex. Fire Chief Greg Butcher reported that Nicole Stickl, 18, of Grand Island, apparently lost control of her vehicle which veered off the roadway and came to a sudden stop. She was removed from her damaged auto in an unconscious state, stabilized by GIFC medics, and transported to ECMC for further medical evaluation and treatment. All GIFC units returned in service at 10:22 p.m. according to Chief Butcher. Grand Island Fire Chief Greg Butcher warns residents about the many weather related hazards that can occur during sub freezing temperatures which now prevail. He notes that inadequate protection from the cold can results in frostbite of the extremities (fingers, toes, etc.). Prolonged exposure can also lead to hypothermia or lowering of the body's core temperature. Both are treatable in the field by trained GIFC responders/medics so that life threatening complications can be avoided. In addition, Chief Butcher urges residents to limit outside activities and to use common sense precautions if tasks such as snow removal must be performed. Dress warmly with layered clothing, pace yourself to avoid overexertion, and seek additional help whenever possible. Another deadly hazard is carbon monoxide, commonly referred to as the "silent killer" because it is colorless, odorless, and extremely difficult to detect without Proven technology (CO detectors). CO is caused by incomplete combustion and has become a significant household problem, according to NFPA research analyst Jennifer Flynn. Defective furnaces, gas fired appliances, blocked or loose flue pipes and chimneys can all contribute to a dangerous PPM (parts per million) CO buildup in the atmosphere. Although vehicle warm-ups are desirable in frigid weather, they should never be done in an attached garage where CO fumes can filtrate through walls, etc. into living spaces. The answer to this unwanted deadly visitor is a working CO detector which will give occupants a timely warning to vacate the premises. 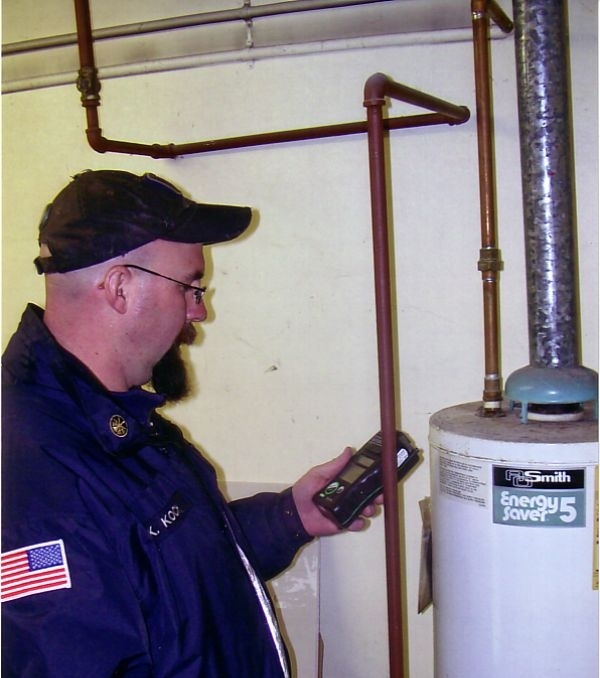 GIFC emergency responders can then determine the exact nature of PPM elevations and identify the cause so that proper corrective action can be taken. If you are using a wood burning fireplace for supplemental heat, make sure that the chimney has been cleaned of creosote accumulations, which are a normal by-product of the burning process. Also, dispose of the hot ashes in a safe metal containing which will reduce the possibility of a secondary fire elsewhere. Please keep these safety tips in mind and have a safe and happy new year for 2009! of appreciation from GIFC officers and are given a round of applause by those in attendance. Town Supervisor Peter McMahon administered the oath of office to newly elected Grand Island Fire Company officers Saturday evening, January 10th at Fire Headquarters on Baseline Road. Firematic and administrative officers were sworn to uphold their community protection duties while meeting the ever demanding challenge of emergency incidents, which ware expected to exceed 1600 during 2009. Greg Butcher commences his seventh term as fire chief and is joined by Deputy Chief Kevin Koch, 1st Assistant Chief Matt Osinski, 2nd Assistant Chief Chris Soluri, Fire Captains Ed Krecisz, Mark Sadkowski, and Pete Sukmanowski, Day Captain Paul Gorman, Fire Police Captain Don Portik, and EMS Captains Bob Cleveland and Jeremy Pullano. President Mike Braun will be assisted by Vice President Jeremy Pullano, Recording Secretary Adrian Pilliod, Line Secretary Dave Cole, Financial Secretary Tony Mastantuono, Treasurer Tammy Jo Gorman, and Sgt.-at-Arms Dave Khreis. B. Reed Wright joins the board of Review and Robert Meyer will hold the position of Benevolent Association Trustee. Dave Tolejko and Don Portik were returned to the Board of Directors for additional three-year terms. 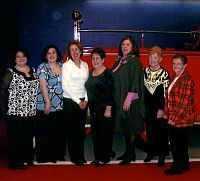 Ladies Auxiliary President Arlene Soluri also introduced her officers as follows: Vice President Jennifer Pullano, Secretary Julie Meyer, Treasurer Danielle Soluri, Sgt.-at-Arms Nicole Butcher, Chaplain Mary Becker, Trustees Marianne Christensen, Barbara Wilson and Teddy Linenfelser. Chief Butcher proudly pointed out that there were many members who made individual contributions "above and beyond the call of duty." Among those recognized was Nicole Gerber, who received a special award for her organizational skills which helped to insure a successful 2008 fund drive. Lance Kohn Sr. was commended for his exceptional accomplishments as an EMS trainer, which has kept the GIFC one of the foremost BLS/ALS providers in WNY. Assistant Chief Soluri received a prestigious EMS award for his tireless coordination of the overall EMS program. 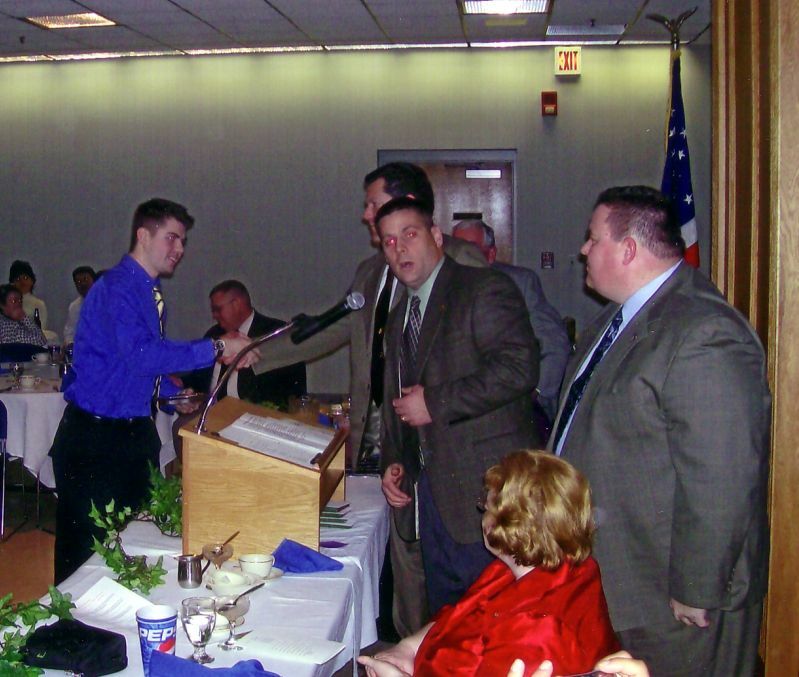 Ryan Ayers was cited as "Rookie of the Year" for his outstanding initiative as a new member. 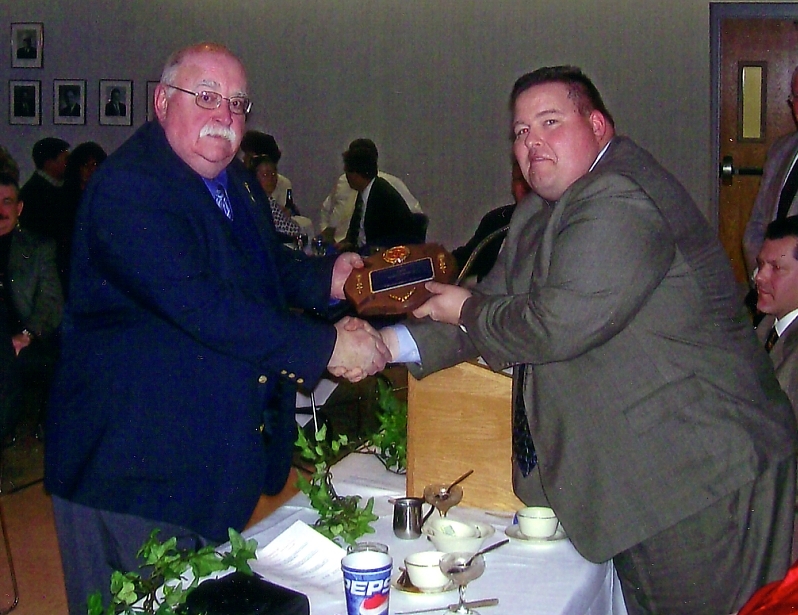 "Top Ten" responders for 2008 were led by Ray Pauley with 871 calls. Others, in sequential order, are Greg Butcher, Kevin Koch, Brian Rock, Ryan Ayers, Ryan Shea, Lou D'Orazio, Mark Sadkowski, Don Turner, and Chris Soluri. In addition, "rookie" firefighters who successfully completed their training during 2008 are as follows: Ryan Ayers, Dave Cich, Dave Dawson, Paul Dhand, Nicole Gerber, Robert Justen, Jeannette Martinez, Pooya Rastomi, Ryan Shea, and Don Turner. Finally, Mathew Braun, Kenneth Sondel, David Sondel, and Ross Arsenault received a heartfelt thank you from the entire membership for donating considerable time and effort towards the 2008 completion of a new GIFC Benevolent Association Health and Fitness Center, located at Station #2. Shortly after 8 a.m. on January 1, 2009, New Year's Day, Grand Island Fire Company Rescue Personnel responded to a series of "chain reaction" MVAs in the southbound lane of the South Grand Island Bridge. GIFC Deputy Chief Kevin Koch confirmed that eleven vehicles were involved in three separate collisions, reportedly caused when drivers were temporarily blinded by the glare of an early morning sunrise. Keefe Murphy, 45, of Niagara Falls had to be extricated from his badly damaged vehicle, which had been rear ended by another driver. He was treated by GIFC medics for upper body trauma and transported to the Niagara Falls Memorial Medical Center for additional medical attention. Eight other individuals were evaluated at the scene but denied injuries and declined hospitalization. A major traffic jam began to clear up at 9:34 a.m. when all GIFC units returned in service, according to Deputy Chief Koch.